Eclipse contributions – What difference can a single developer make? I frequently hear that a single developer cannot make a difference for the Eclipse project. I think that is not true. 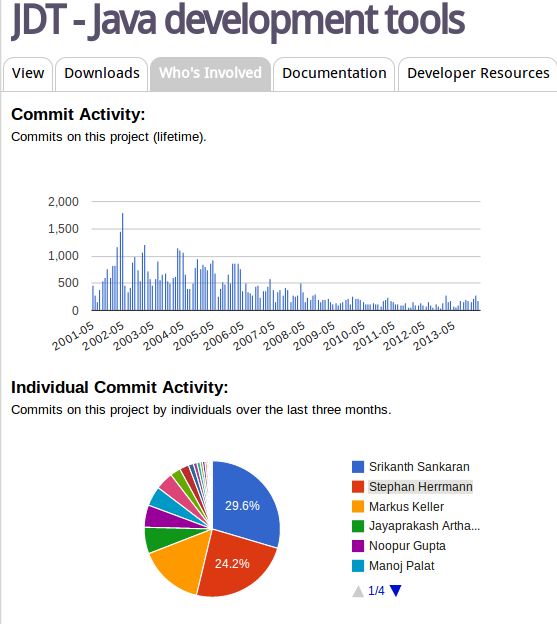 The Eclipse project page show that in a lot of projects a handful of developers make most of the work. See for example JDT project page and you see that Stephan Herrmann makes 24 % of the changes in JDT. Kudos to Stephan for this. I hope others see this as opportunity to get involved into Eclipse development and to make a difference. See Eclipse platform development guide for starting points. If you live close to Hamburg, please join our Eclipse Hackathon Friday this week. This entry was posted in Eclipse, Lars Vogel and tagged Eclipse. Bookmark the permalink. 5 Responses to Eclipse contributions – What difference can a single developer make? I applaud for all committers doing much work in the Eclipse projects. However, i feel one point is missing in your investigation: Although the general process for contributions has improved, there is still quite a difference between what a single _committer_ can do, and what a single _contributor_ can do. It is frustrating if you create bug reports or patches, and no one looks at them. As a (non committer) contributor, you still very much depend on project committers, and their time is a scarce resource. Therefore, from the outside it does not look that easy to me as described by you. Michael, I have not seen Gerrit reviews from you. If you still have patches in Bugzilla I highly recommend to convert them to Gerrit views. We currently look (more or less) only at Gerrit reviews. I’d be very, very scared and concerned if it was my project w/r to distribution of commits. If a single developer stands out that much, something is very wrong IMHO. @scared: If until now you believed that Eclipse (and in particular its core projects) has developers in abundance, then yes, you might be scared to learn that nothing can be taken for granted here. It is *possible* that at some point in the future Eclipse will not be able to deliver a next release due to lack of developers. I believe this holds for about every mature open source project. @Michael: I guess use of bugzilla vs. Gerrit is still a mix and a migration in progress. From (my) committers p.o.v. it would be more important, however, how you interact with the committers. In JDT we may not be able to pick up each patch immediately, but if you discuss your approach in bugzilla or another suitable channel, and if you persist in reminding us of your work, we do our very best, not to let any patch fall through the cracks, promised! Differentiating committers vs. contributers is not meant to block any patches, just to ensure a high quality and alignment with the overall design. Open source projects are people, so try to connect to the people in the (sub-)project you want to contribute to.